A new report has found that transitioning to a clean energy economy would be an economic boon to the United States, increasing employment, reducing costs to consumers, and benefiting investors. The report, from NextGen Climate America, showed that investment in efficiency, renewable sources of electricity, and fuel switching — such as moving from fossil fuel-powered cars to electric vehicles — would add a million jobs by 2030, and roughly 2 million jobs by 2050, while increasing GDP by $290 billion and improving household income. The researchers looked at scenarios that would reduce emissions by 80 percent below 1990 levels. “While addressing climate change is one of our greatest challenges, it is one of our greatest opportunities to build the economy,” Tom Steyer, co-founder of NextGen and billionaire climate activist (and a board member of the Center for American Progress), said on a call with reporters Monday. The construction industry, in particular, could see a huge bump in jobs — to the tune of 1.2 million more in 2050 than under the business-as-usual scenario. That’s because it will take a lot of people to build the wind farms, install the solar panels, and retrofit the buildings needed to reduce America’s dependence on fossil fuels. Efforts to lower emissions are often subject to the criticism that they will hurt the economy, even though actual examples of programs have shown that efficiency and clean energy programs can actually boost economic factors like household disposable income. “The go-to argument against [climate action] is that it’s bad for the economy and it’s a job killer,” Steyer said. This report shows otherwise. Steyer also pointed out that in the last few years, jobs in the solar industry have grown 20 times faster than the rest of the economy. In addition, the so-called reference case — a general economic forecast — did not take into account the potential costs of not addressing climate change. Recent reports have shown climate change poses a significant financial risk. According tothinkprogress.org, the report studiously stays away from telling policymakers how to get to 80 percent less emissions. Rather than policy recommendations, the researchers took a feasibility study and used it to build out the economic impacts. The researchers used a 2014 report, Pathways to Deep Decarbonization in the United States by Energy and Environmental Economics, which looked at whether it was technologically feasible to reduce carbon emissions significantly enough to avoid 2°C warming. Economist Jeffery Sachs told reporters it was critical to first determine where we want to go, and then tailor policies to achieve those end goals. “Too often our national policy conversation jumps straight to the question, ‘Is it a tax? Is it this or that?’ Whereas what this report does, much better, in my opinion, is to show here’s where we want to go,” Sachs said. 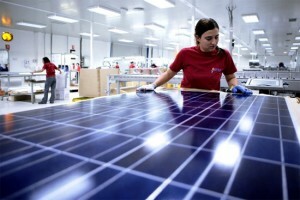 Overall, the report painted an optimistic picture of the economy under a clean energy scenario. It’s worth noting, though, that the gains will not be across the board. Job growth in two of the nine regions was expected slow under the low-carbon scenarios. Those two regions — which include roughly the area from Montana to Texas, a fossil fuel heavy swath of the country — would have slower job growth. That means that as the country does develop policies to achieve these goals, it will likely need to dedicate resources — educational and economic — to areas that will have a harder time getting off fossil fuels. “To help them adapt we need to provide dedicated new resources for economic diversification, job creation, job training and other employment services for workers and communities affected by job losses at coal mines and coal-fired power plants,” the authors said. Jobs notwithstanding, all regions were found to see increases in disposable income.